Normally, inflammation is a good thing in our bodies (like when it’s working to fight a fever or sore throat) as part of our body’s immune response to help us heal. However, if immune cells overreact we could be in an uncomfortable situation. While research on anti-inflammatory diets is still being conducted, it’s widely suggested that what we put (and don’t put) into our bodies affects the “bad” inflammation. Making sure to consume a fair share of fruits, veggies and omega-3s is usually at the core of all suggestions – and the main fare found in a Mediterranean diet (stay tuned next month for my update on my foray into a Mediterranean diet) – as well as staying away from things such as sugar and processed foods. 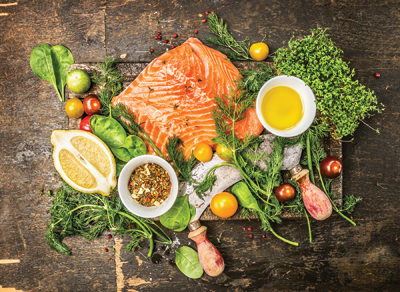 The Mediterranean diet, as well as Dr. Weil’s anti-inflammatory diet, are both consistently ranked high for U.S. News & World Report’s Best Diet Rankings for their nutrition and anti-inflammatory properties. The Arthritis Foundation provides a lot of help when it comes to dietary restrictions. They have supplied a list of things to avoid when it comes to inflammation: Sugar, saturated fats, trans fats, omega-6 fatty acids, refined carbohydrates, MSG (mono-sodium glutamate), gluten, casein, aspartame and alcohol. On the opposite end, Health.com points out a few key foods that are thought to help combat inflammation: Fatty fish, whole grains, dark leafy greens, nuts, ginger, turmeric, garlic, onions and olive oil.